Warner & Swasey / Wiedematic Mach II mdl. W-2040 CNC Turret Punch Press s/n 446 w/Warner & Swasey CNC Controls, 24-Station Turret, 48” x 72” Table. Warner & Swasey / Wiedematic Mach II mdl. W-2040 CNC Turret Punch Press s/n 306 w/ Warner & Swasey CNC Controls, 24-Station Turret, 48” x 72” Table. DiAcro mdl. 75-8 75 Ton x 8” CNC Press Brake s/n 6750479135 w/ DiAcro Select-A-Flange and Select-A-Bend Controls, 96” Bed Length, 8 1/8” Throat, 80” Between Uprights. Promecam R-35-20 35 Ton x 79” Up-Acting Press Brake s/n 2-035-20-026 w/ Manual Back Gage, 79” Bed Length, 8 1/8” Throat, 66 ½” Between Uprights. 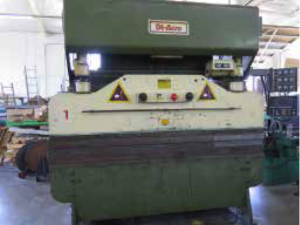 DiAcro 96” Hydraulic Press Brake w/ Manual Back Gage, 9 1/8” Throat, 62” Between Uprights. Amada M-1232 1/8” Cap x 50” Power Shear s/n 1230810 w/ Amada Controlled Back Gaging, 75 Strokes/Min, 44” Squaring Arm, Front Material Support. Pexto mdl. 137-L 16GA x 37” Kick Shear s/n 7/73 w/ Back Gage. Amada mdl. CS-220 8 5/8” x 8 5/8” Power Notcher s/n 543307 w/ Fence System, Foot Control. Haeger mdl. HP2.5A 2.5 Ton x 12” Hardware Insertion Press s/n 058 w/ Tooling. Roper Whitney mdl. 58 Kick Punch s/n 3134-4-74 w/ 18” Throat and Punch Tooling. DiAcro 36” Hand Roll w/ 2” Rolls, Stand. Bridgeport Vertical Mill s/n 101015 w/ 1Hp Motor, 80-2720 RPM, 9” x 42” Table. Scotchman Miter Cold Saw w/ 2-Speeds, Manual Clamping, Work Supports. Powermatic mdl. 143 14” Vertical Band Saw s/n 5-1951-3. Buffalo / Delta 4-Head Gang Drill Press w/ 14” x 50 ½” Table. Clausing Variable Speed Pedestal Drill Press w/ 330-2640 RPM. Duracraft mdl. DP-514 Bench Model Drill Press w/ Stand. Ingersoll Rand 15Hp Horizontal Air Compressor w/ 2-Stage Pump, 120 Gallon Tank. Speedaire 15Hp Horizontal Air Compressor w/ 2-Stage Pump, 120 Gallon Tank. Ingersoll Rand 10Hp Horizontal Air Compressor w/ 2-Stage Pump, 80 Gallon Tank. Finish Pro mdl. FP-2560 25” Belt Grainer s/n 15-051223 w/ Finish Pro Controls. Timesavers mdl. 125-M1 25” Belt Grainer s/n 9687. Delta / Rockwell 5” x 10” Surface Grinder w/ Universal Grinding Head, 5” x 10” Magnetic Chuck. Pacific Abrasives 1.5” Belt Sander w/ Stand. A.O. Smith mdl. A2000AD HFGW 200 Amp AC/DC Arc Welding Power Source s/n 1227-6111-7 .SC-IC Unispark mdl. SC-300 60kVA Spot Welder s/n 08426 w/ 20” Throat. Lincoln Pro-Cut 55 Plasma Cutting Power Source s/n U1990308714 w/ Cart. 40” x 84” and 48” x 67” Welding Tables. Warner & Swasey Turret Punch Tooling, Press Brake Tooling, Cabinets w/ Insertion Hardware, 6” Angle-Lock Vise, Power and Hand Tools, Dake Arbor Press, (3) 24” Dial Height Gages, 12” and 8” Dial Calipers, Granite Surface Plates.